Hi everyone! お久しぶりです！( = Ohisashiburi desu.) It has been a long time! And ただいま！( = Tadaima!) I am back!! I’m officially back from the summer vacation. Since my brain is still in vacation mode, I will give you a mini lesson today. The key word for today is…..
= ( Please) Go a head! = Oh, no, please (you) go ahead. = Soredewa osaki ni shitsurei shimasu. = OK, then, let me go first. (←the literal meaning is…I will take the liberty of going ahead of you. or doing something before you do). = Sorede wa shiturei shimasu. = If you insist.. allow me to go ahead. = “Please excuse me for leaving before you. = (The literal meaning) You must be tired after all the hard work today. = Thank you for your hard work. / Thank you for all your work today. = Osaki ni shiturei itashimasu. = Saki ni itte matte imasu. = I will go ahead and wait for you there. = Saki ni itte matte ite (kudasai). = Go ahead and wait for me there. = Saki ni itte mattete! = Just go ahead and wait for me there! = Mou kouyatte juppun mo tatsundakedo…Watashitachi reigi tadashii desho? = We’ve been doing this for ten minutes now. We are very polite, aren’t we? Hi, I’ve something of an urgent request. I live one rail stop from a co-worker who will not hear of me leaving a bar before he has become too wobbly to support himself. I like a drink myself, but I’ve come to dread the ride home because of my senpai’s constant need to debark early in order to relieve himself—occasionally in terribly inappropriate places. I am always drunk when I attempt the following conversation, but I assure you my Japanese is little better when I’m sober: all I know I’ve picked up from variety shows, so my vocabulary is limited; my particle selection is practically random; I have no formal training so I have no business breaking rules that I don’t even know yet in order to speak informally; and I have little sense for ordering phrases so that they make the best, er, sense. 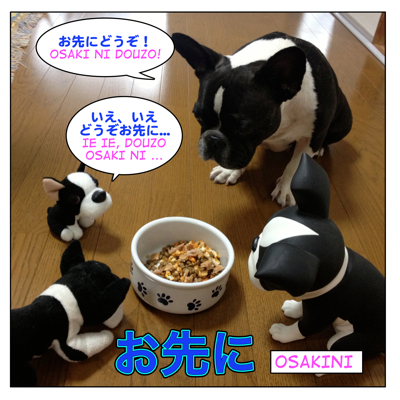 I think I could be more assertive—or at least make my もんだい better-understood—if my Japanese weren’t so godawful. Help me Maggie-sensei, you’re my only hope. Can you write the English translation for the Japanese sentences you wrote? Can i use お先に or お先にどうぞ！when i open the door for someone? just like the “ladies first” kind of thing. Yes, you can say お先にどうぞ when you let someone go ahead of you or you can just say どうぞ. I have a question. Can I say 「お疲れ様でした。」 to my teacher after class has ended or is it only the teacher who says can say it? If my teacher says it to us, how should we reply? お疲れ様でした is a polite expression and you can use it to someone superior. So some people do say お疲れ様でした to one’s teacher after the class but but ありがとうございました is more appropriate. I know my question has not much to do with this lesson, other than the kanji 先 itself. I have a really hard time understanding the overall meaning of the following sentence, especially the last part. As a matter of course, there are many other countries in the world that do not have democratic electoral system, so in that kind of meaning, having such system is already quite a good thing. One could say that the electoral system in Japan is “Better than nothing”, and there is time when there are a lot of municipal/ national citizens could think (point out) “That guy will win (the election)”, so it’s fairly predictable, isn’t it? I know it sounds a bit awkward, so could you help me out, sensei? Your translation is pretty good. 2) もう少し先なのでしょうか : you translated it’s fairy predictable. Thank you for your correction sensei! Now things are much clearer to me. Since I had no idea 少し先 means so I just assumed the writer wants to criticize the not-so-democratic of the so-called democratic electoral system, then translated the last part accordingly. I am very happy to hear my blog helps your Japanese. Hmmmmm… I just tried to comment and I don’t think it worked. Thanks for the great lessons. I have to start exploring your archive of lessons they are a great resource. Thank you for your comment. There are a lot of lessons. Hope you come back here soon again!